The Texas Facilities Commission (TFC) builds, supports, and manages over 28 million square feet of state-owned and leased facilities that house over 62,000 state employees in over 100 state agencies, all working in the service of the citizens of Texas. 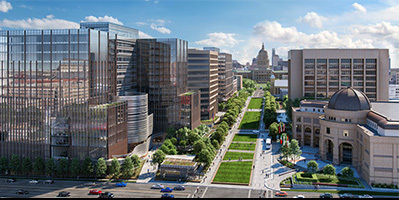 TFC oversees a portfolio of office space, storage, warehouses, parking garages and grounds of buildings across 283 cities and towns in Texas. Our team provides and contracts for the design and construction, property management, grounds and custodial services, recycling and waste management services, building climate and energy automation, and the fire and security services required to keep State agencies working for our constituents. Our goal is to serve with excellence by providing high-quality work environments that are functional, energy efficient, and cost effective to operate. TFC's portfolio of leased and owned facilities encompasses more than 28 million square feet of office, warehouse and parking facilities, supporting the needs of over 100 state agencies and housing over 62,000 state employees in 288 cities throughout Texas. TFC administers the state and federal surplus property programs. The State Surplus program has property available for sale to the general public, including surplus vehicles, furniture, and equipment. This program assists state agencies with the disposal of surplus and salvage state property in a way that maximizes revenue to the State. The facility is located in Austin, Tx and also sells items abandoned or lost at state airports. The Federal Surplus program involves managing the disposition of surplus and salvage property donated to the State by federal programs. Organizations certified as eligible under federal agency regulations can receive and use federally donated property, but the general public may not participate in this program. Examples of eligible organizations include political subdivisions, volunteer fire departments, educational or public health institutions, and some nonprofit assistance organizations. For the facilities managed by TFC, FDC is responsible for project management oversight, minor construction, building infrastructure maintenance and repairs, and energy management. • Minor Construction provides construction services to state agencies for small projects. • Small Contractor Participation Assistance provides opportunities for small contractors to participate in large public works projects. • Office of Energy Management is dedicated to the energy management of buildings, parking garages, and ancillary facilities managed by TFC. Potential energy and utility savings initiatives are evaluated as part of all projects and ongoing operation. Administration assists agency operations by providing daily support in areas such as legal, financial, and human resource management. - Learn how to write a winning proposal for solicitations from the Texas Facilities Commission. - What happens to all those items that get confiscated by the TSA?